The Genesis Sedan is handsome, and the lack of a Hyundai logo on the front of the car is an interesting design choice. Inside, the Genesis stays on the luxury sedan target with high-tech gizmos and attractive materials. 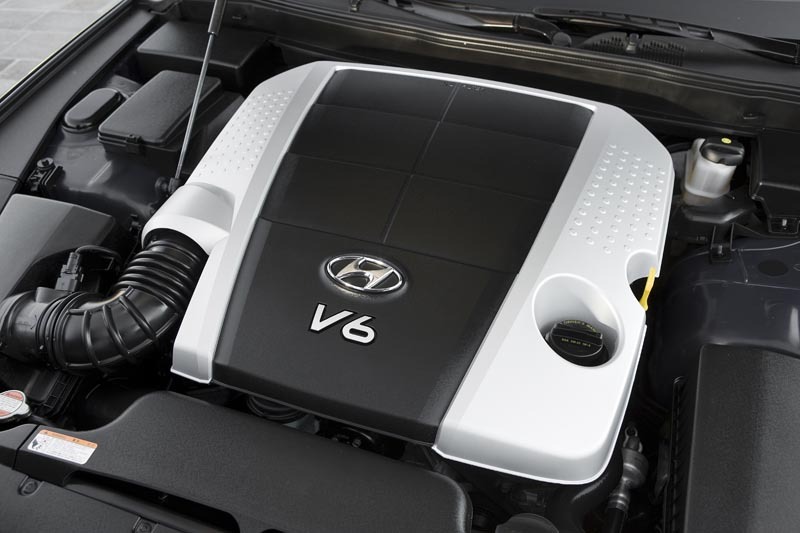 Hyundai's Lambda V6 engine provides ample thrust, and we were shocked to find that it's just slightly behind a Lexus engine in smoothness. Better than: A surprising number of more expensive cars. But not as good as: The Genesis Coupe will be (for us, anyway). For many years, Korean manufacturer Hyundai has been offering models that are essentially bargain-bin versions of popular Japanese cars like the Camry, Civic and RAV4. To bolster consumer confidence, they introduced their famous 10-year, 100,000-mile warranty, and with each generation Hyundai has been improving quality while undercutting the big dogs. The new Hyundai Genesis Sedan builds on that momentum by taking a very serious swipe at the likes of Lexus and BMW. The Genesis is available with a 290-horsepower V6 or a 375-horsepower V8--we drove the V6 model. Hyundai's Genesis targets the market for cars like the Lexus GS, Inifniti M, Pontiac G8, and BMW 5 Series. For the record, a V8 BMW 550i starts at $60,400; the V8 Genesis, with 15 more horsepower than the V8 BMW, starts at $22,000 less. The V6 Genesis starts at $32,250; compare that to $44,850 for a Lexus GS. Forty-five grand is no paltry sum to spend on a Hyundai, but even the V6 Genesis comes with all the goodies you'd expect in a luxury sedan, like leather seats (heated up front) and a six-speed automatic. 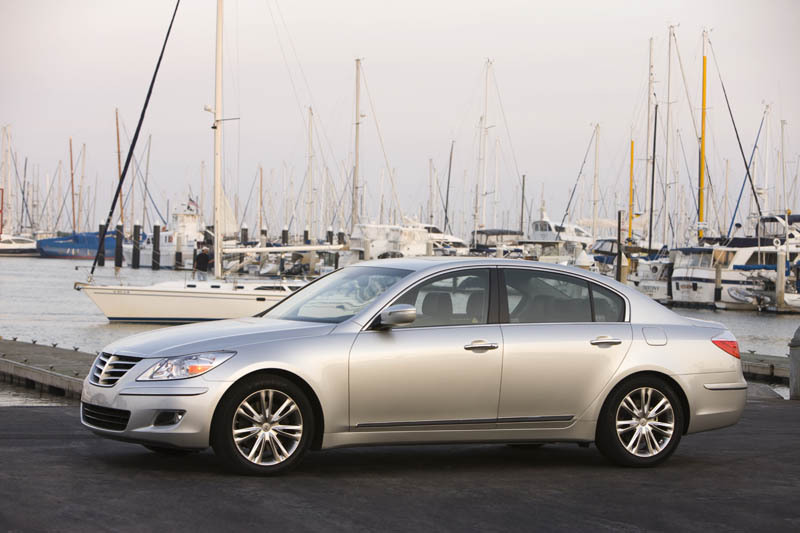 The Genesis we drove had an upgrade package with 18-inch wheels, a 14-speaker Lexicon sound system, and a moonroof. The GRM staff was genuinely impressed by the fit, finish, power and composure of this big sedan. While we're much more interested in the upcoming Genesis Coupe--it'll be based on the same basic RWD platform--any of our readers shopping for a luxury sedan should really give the Genesis a try before making a final decision. That was the V6? Wow, can't wait for the V8. I only drove the Hyundai a little bit, but if first impressions mean much then Hyundai did a swell job. I was mainly a passenger in this one, and I can say that the back seat is very nice. Looks like Hyundai has been studying Toyota. I read the reviews above three times now, but I still feel like I'm missing something. How did it drive??? It was nice, solid build quality. A few slight hums/buzzes here and there, but otherwise, quiet and nice. Good power, reasonable chassis. Really, no terrible habits---but it was still a large luxury sedan with all that entails. I'd compare it with the Lexus GSwhatever. Rear wheel drive and good power, but not a sportster. I have ridden in the V8 and it has lots of oomph! I owned a 2005 Tibby. Very good looking car. There is a reason scca puts it in H stock. Is the rear wheel drive coupe for real? I am very interested in these, for my work vehicles I need the room and reliability, also any idea on the economy? I have AD900 Pro and AD900 manual，but i don't know where i can attach it.anyone need it ,pls feel free to contact me.I am happy to share it to everyone.